Do you have first hand information about this event. I have just returned from two weeks of ministry in Cuba and have e-mailed several pastors who should be in the loop on this and none can confirm it took place. It would truly be a miracle if this size gathering of Christians was allowed by local or national authorities. Hi Jack, Thanks for your question. Yes, we know the pastors and ministry leaders involved. We should have an offline conversation about the location in Cuba and see who we both know and who can confirm this for you. I am out of the office until July 19th and have only limited access to the Internet. Hence, the late reply. Hope to talk with you soon. 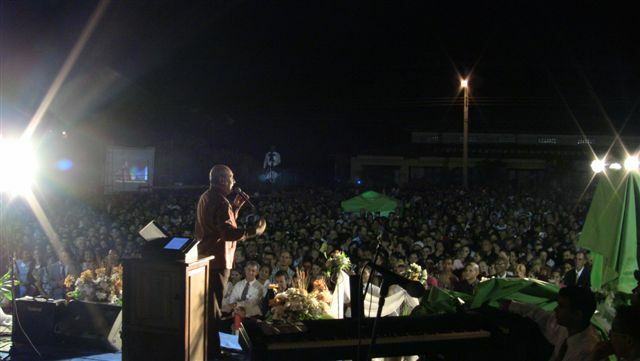 I’m sorry to inform you that you have erroneously stated that this was the FIRST “open air-outdoor evangelism in Cuba. The FIRST one took place in the summer of 1999. You can verify this with Johnathan Cahn, the author of the book “The Harbinger.” I know this, because I was there with him when they conducted the FIRST “Open air-outdoor” evangelistic meetings EVER in Cuba under the current Communist regime. A REVIVAL of “supernatural” miracles, along with signs and wonders, and thousands of salvations. And by the way, we had one “outdoor meeting” in EVERY PROVINCE (there are 18 of them) in Cuba! Thanks for your note. As I wrote in my post, this was our church partner’s first out door evangelistic crusade. I did not want to imply that this was the first ever. I am glad you are interested in Cuba and I hope you continue to preach the Gospel and help those living in poverty. Praise the Lord! It’s really encouraging to read reports like this and realize God is moving wonderfully in those places where at one time the gospel wasn’t freely allowed.